What’s the difference between the brown vibrio sonic and brown pro? The main difference is that the Vibrasonic wanted to have lots of clean headroom,so the heavy duty transformers from the 80watt showman were used,which could easily handle the 40 watts without overheating…think of it as a showman with two 6L6’s removed….and also it was fitted with a JBL instead of the Jensen speaker.The Vibrasonic also had an extra valve for the Long tail phase inverter Tremolo system which was the most complicated system Fender had developed,giving a very distinctive sound! The Vibrasonic 1 x 15″ Combo cost more than a Showman. I have 63 what are they worth? Has anyone here ever seen a blackface 1963 vibrasonic? Someone certainly could have retolexed a ’63 in black at some point but the “Blackface” era didn’t start until ’64. 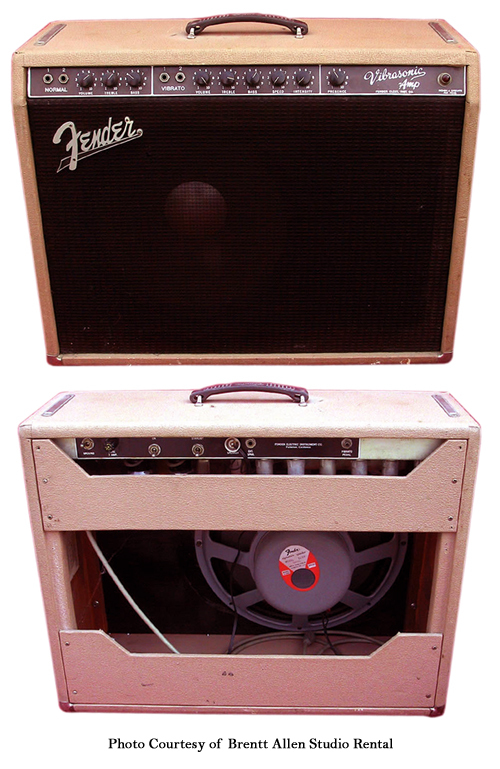 Yes, as the info states, the Brownface era was 1959-1963, with the brown tolex from ’61-’63. Mine is a 1963, mostly original, with a re-tolexing in the original Fender brown for this amp. The grille cloth was replaced with a period correct oxblood with gold stripe to enhance its appearance. The famous Tremolo system remained intact & in fantastic sounding condition! It has the Original 1963 JBL D-130F 15″ speaker, which had functioned superbly well until recently, when a vintage speaker expert did a by-hand re-coil in vintage spec wiring (NOS, and the exact same length of wire went back on) to keep it as original as possible. He strengthened the original cone for a longer life, as well. Everything else, except for some minor work on shot capacitors, is original. All the original tubes are in place. Regarding the value of these amps, I’ve seen two, in very good to excellent condition on Reverb.com going for U.S. $2,800 & $2,995, respectively. I would put mine at a higher value due to its actual original parts being intact. Yeah but mine also has the blackface face plate and the serial number that puts the make in october 1963. Right when they were finishing up the vibrasonics. Im fairly certain that a few of the blackface vibrasonics left the factory before they decided to scrap them. Just so few that they never bothered to take note of it. Now of course theres always a chance that someone did both the face plate and the tolex. Just unlikely. I forgot to mention that the grill cloth is a blackface grill cloth. Not from the ones you see on the brownface amps. And the the staples appear to be period correct from the early 60’s. Nothng looks altered.